It's really lovely when readers take the time to write to me at the office - brightens up my day! "I just wanted to say a huge thank you for the Crafty Individuals stamps that I won...I've admired their stamps for a long time but never quite been brave enough to jump in and use them...I hope you like my first attempt at making a card with them." I think you certainly did the stamps justice! Your card now sits on my wall with the rest of my lovely collection :). Finally started my xmas cards - YAY! I've finally started on my xmas cards - about time eh? It's no secret that I am not a big fan of Christmas but I do like to make cards for my crafty friends - i.e. people I know will appreciate them! Here's one of my creations. 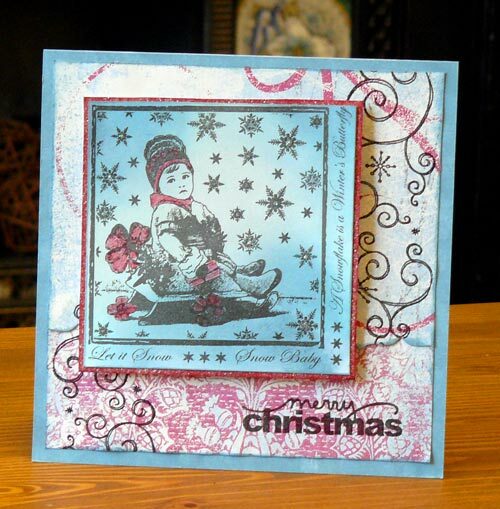 The papers I've used are the simply yummy PaperArtsy Rum & Raisin collection. 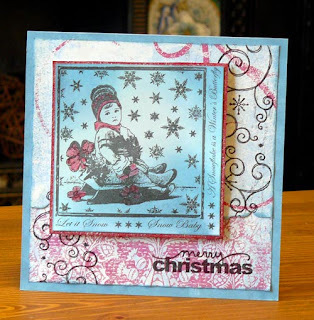 The main stamped image is the snow baby from Crafty Individuals - isn't he adorable? It's an easy card - I simply stamped him onto a piece of card coloured with various Versamagic inks and then highlighted a few details with red Coloursoft pencil to match the image with the background. I stamped the swirls to 'frame' the image a little. You can't tell from the pic but the swirls are embossed with crystal powder and the snowflakes are highlighted with Stickles so they are all twinkly and Christmassy. I've made a whole other one card I can show you in a few days! CS regular Kay Carley is holding a contest on her blog to win one of her new DVDs! Just enter a Christmas card for a chance to win. Check it out here. Kay devised these DVDs with Craft Stamper and they are packed with ideas and techniques for your card making and other paper crafts. All the DVDs focus on stamping (of course!) and there are three in the series: Basics & Beyond; Colouring Techniques and Shrink Plastic. You can see more details here. I started on my xmas cards yesterday so might finally have something to show you later in the week! 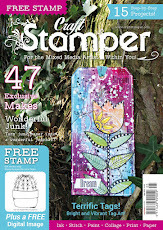 I've added a new feature to the CS blog - a link list of the blogs of all the talented people who have appeared as a Featured Artist in Craft Stamper magazine. Scroll down the sidebar and you'll find all the links beneath the contributor blogs list. Well worth checking out for inspiration. Enjoy! I know who is Stamper of the Year 2009! But I'm not telling! The January issue went to print just last week with five lovely pages of work by the winners and finalists in this year's competition. If you entered the competition there is not long to wait now to find out if you are one of the chosen ones - the magazine goes on sale on the 4th December (subscribers will probably get it a smidge earlier). None of the winners knows if they have been chosen - we like to surprise them ;). Thank you to everyone who entered our competition - there is a lot of talent out there! 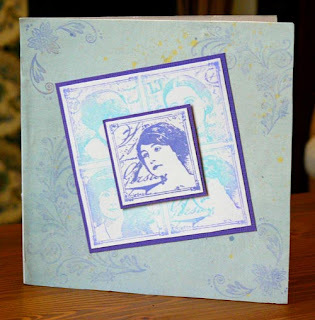 We have another EXCLUSIVE subs offer this issue, from PaperArtsy. These lovely stamps are only available from Craft Stamper for the duration of the offer and so you need to take out (or renew) a subscription to get your mitts on them! If you've been thinking about giving a subscription as a Christmas gift, now is the ideal time as you can guarantee the recipient won't have these stamps in their collection! I think they are rather yummy - I hope you like them too :). Exciting news about readers' gallery! 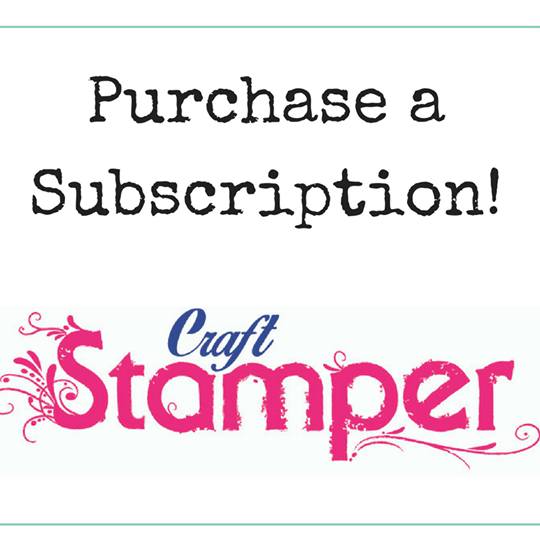 How would you like to be published in Craft Stamper? From January issue onwards we will no longer be having a readers’ gallery feature in Craft Stamper magazine, but we will be offering something much more exciting instead! As the standard of submissions we receive is so high, in the future we are offering readers the chance to have their work published in article format with a large photo and instructions so other readers can be inspired by what you create. Each chosen submission will have a whole page in the magazine to itself. This is open to everyone whatever style you enjoy and whatever level you are at with your crafting. We are looking for interesting, inspiring and attractive projects – projects don’t have to be especially technical or advanced, it is more important that they are well made and finished. In the first instance, please submit your artwork with brief instructions. If you are chosen for publication we will request the actual project to be sent in for photography and more detailed written instructions plus a list of materials. Please note that the stamps you use for these submissions should not be discontinued. Please send your submissions to the Editor marking the correspondence ‘Reader Submission’ and each month we will look to select one card or scrapbooking project and one altered art or mixed media project to publish. There is no prize or fee available for submissions, but if chosen you will see your work published in the magazine and receive a complimentary copy of the issue in which you are featured. I hope you'll email me your project ideas to cs@traplet.com. 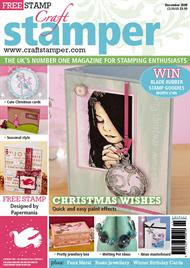 Who knows - you could see your work in a future issue of Craft Stamper magazine! Every year Christmas seems to arrive quicker and quicker, and as ever, so comes the panic to make all the Christmas cards in time. I'm sharing one, that I have just made, with you, I hope you like it. (It's for my husband....don't tell him though!) 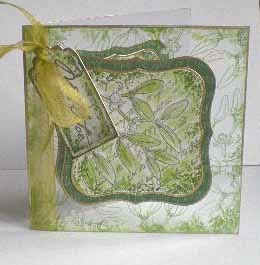 The construction is the same as for the acetate card on page 7 of the December Craft Stamper Magazine. 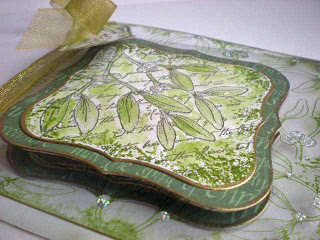 For the backing papers I have used paper from Artylicious Season's Greetings CD Rom and stamps from the Elusive Images Mistletoe Script theme plate. Images were stamped in StazOn and then water coloured. Glossy Accents and Stickles add a bit of texture and glitz. Here's a little close-up of the central image. I had a fun day yesterday at the NEC Hobbycrafts show. It was lovely to see quite a few stamps on offer at the show this time - PaperArtsy, Sir Stampalot, Craft Fairy, Alicraft, Artist Trading Post, Lavinia Stamps and Stamp Addicts were all there to name just a few. This is my local show and I generally go every year for a bit of retail therapy. I always forget how packed it gets - this year was just as busy and I was quite worn out by the end of the day! So tired in fact I've yet to unpack my lovely purchases (have set aside some stroking time for this evening ;) ). Just a quick post to let you know that the Christmas issue of CS is out on Friday. Lots of seasonal inspiration for you, plus a fair few non-Christmas offerings for those of you who are a bit on the bah-humbug side (like me I must confess!). I've not made a single xmas card yet as I can't say I enjoy it much. Something about production-line crafting leaves me cold. I do have to make a few though, so perhaps you can inspire me? Share your Christmas cards with us by leaving a comment.